The Lake Helen, FL area has had 0 reports of on-the-ground hail by trained spotters, and has been under severe weather warnings 14 times during the past 12 months. 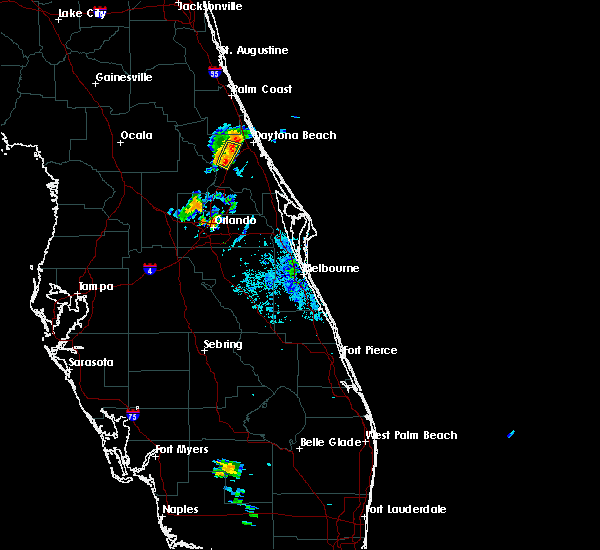 Doppler radar has detected hail at or near Lake Helen, FL on 53 occasions, including 4 occasions during the past year. 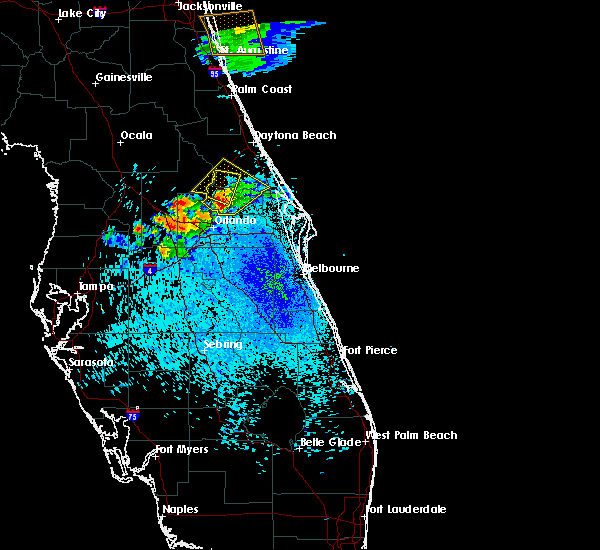 4/6/2019 8:52 PM EDT At 852 pm edt, a severe thunderstorm was located near osteen, or near deltona, moving southeast at 15 mph (radar indicated). Hazards include 60 mph wind gusts and quarter size hail. Hail damage to vehicles is expected. Expect wind damage to roofs, siding, and trees. 11/2/2018 5:45 PM EDT At 543 pm edt, a line of severe thunderstorm was located from deland to mims, to cocoa, moving northeast at 45 mph (radar indicated). Hazards include 60 mph wind gusts. Expect damage to roofs, siding, and trees. 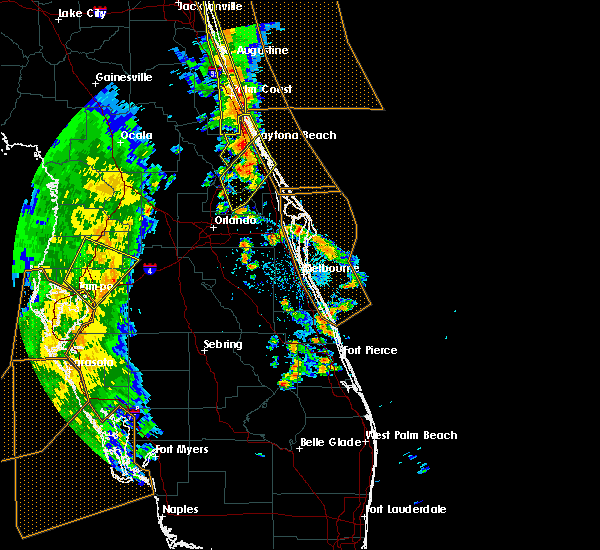 Locations impacted include, deltona, daytona beach, ormond beach, mims, titusville, port saint john, and cocoa. 8/13/2018 6:31 PM EDT At 631 pm edt, a severe thunderstorm was located over sanford, moving northeast at 15 mph (radar indicated). Hazards include 60 mph wind gusts. Expect damage to roofs, siding, and trees. Locations impacted include, deltona, sanford, deland, orange city and lake helen. 7/22/2018 3:23 PM EDT The severe thunderstorm warning for northeastern lake and central volusia counties will expire at 330 pm edt, the storm which prompted the warning has weakened below severe limits, and has exited the warned area. therefore, the warning will be allowed to expire. a severe thunderstorm watch remains in effect until 800 pm edt for east central florida. to report severe weather, contact your nearest law enforcement agency. they will relay your report to the national weather service melbourne. 7/22/2018 3:03 PM EDT At 303 pm edt, a severe thunderstorm was located near debary, moving east at 30 mph (radar indicated). Hazards include 60 mph wind gusts. Expect damage to roofs, siding, and trees. Locations impacted include, deltona, sanford, deland, orange city and lake helen. 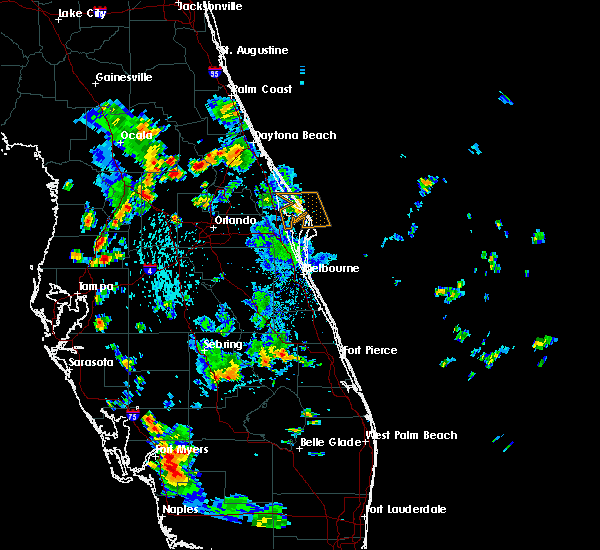 7/6/2018 3:10 PM EDT The severe thunderstorm warning for central volusia county will expire at 315 pm edt, the storm which prompted the warning has weakened below severe limits, and has exited the warned area. therefore, the warning will be allowed to expire. however gusty winds, frequent lightning strikes, and heavy rain are still possible with this thunderstorm. 7/6/2018 2:51 PM EDT At 250 pm edt, a severe thunderstorm was located over deltona, and is nearly stationary (radar indicated). Hazards include 60 mph wind gusts and quarter size hail. Hail damage to vehicles is expected. expect wind damage to roofs, siding, and trees. Locations impacted include, deltona, sanford, orange city, debary and enterprise. 7/6/2018 2:36 PM EDT At 236 pm edt, a severe thunderstorm was located over deltona, and is nearly stationary (radar indicated). Hazards include 60 mph wind gusts and quarter size hail. Hail damage to vehicles is expected. Expect wind damage to roofs, siding, and trees. 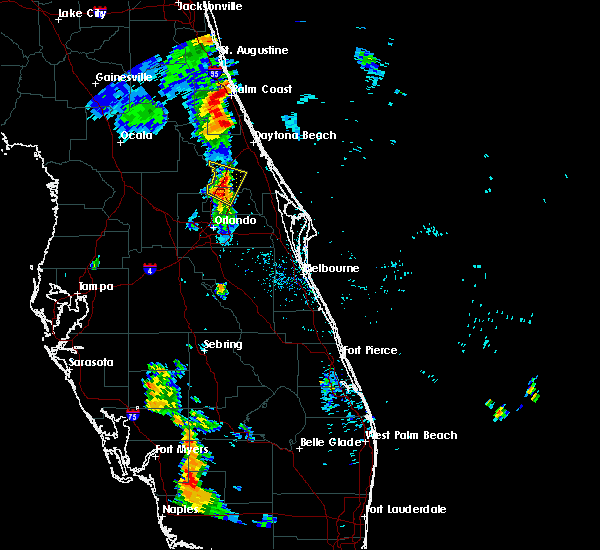 5/15/2018 5:07 PM EDT The severe thunderstorm warning for central seminole and central volusia counties will expire at 515 pm edt, the storm which prompted the warning has weakened below severe limits, and has exited the warned area. therefore, the warning will be allowed to expire. to report severe weather, contact your nearest law enforcement agency. they will relay your report to the national weather service melbourne. 5/15/2018 4:48 PM EDT At 447 pm edt, a severe thunderstorm was located over osteen, just southwest of near deltona, moving north at 20 mph (radar indicated). Hazards include 60 mph wind gusts and quarter size hail. Hail damage to vehicles is expected. expect wind damage to roofs, siding, and trees. Locations impacted include, deltona, sanford, oviedo, winter springs and deland. 5/15/2018 4:33 PM EDT At 433 pm edt, a severe thunderstorm was located over sanford, moving north at 20 mph (radar indicated). Hazards include 60 mph wind gusts and quarter size hail. Hail damage to vehicles is expected. Expect wind damage to roofs, siding, and trees. 4/15/2018 4:00 PM EDT At 359 pm edt, severe thunderstorms were located along a line extending from 6 miles southwest of daytona international speedway to 8 miles west of new smyrna beach to near deltona to 7 miles northeast of osteen to near maytown, moving north at 50 mph (radar indicated). Hazards include 75 mph wind gusts. Expect considerable tree damage. damage is likely to mobile homes, roofs, and outbuildings. Locations impacted include, deltona, daytona beach, port orange, new smyrna beach and edgewater. 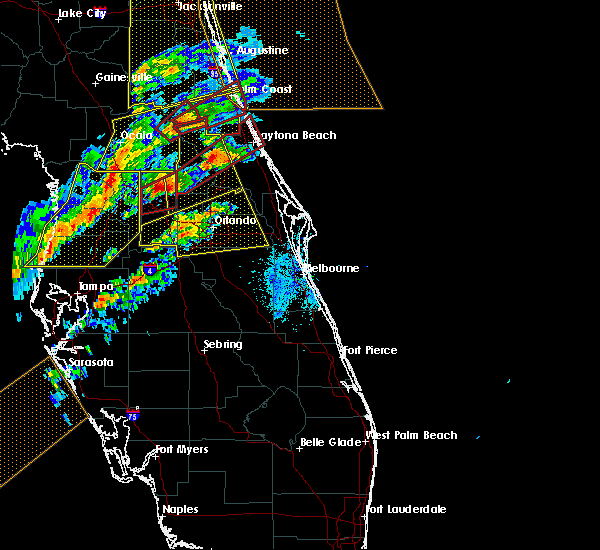 4/15/2018 3:56 PM EDT At 355 pm edt, severe thunderstorms were located along a line extending from near ormond-by-the-sea to 7 miles east of deland airport, moving northeast at 45 mph (radar indicated). Hazards include 70 mph wind gusts. Expect considerable tree damage. damage is likely to mobile homes, roofs, and outbuildings. Locations impacted include, daytona beach, ormond beach, deland, holly hill and ormond-by-the-sea. 4/15/2018 3:48 PM EDT At 347 pm edt, severe thunderstorms were located along a line extending from lake helen to near geneva, moving north-northeast at 50 mph. these are very dangerous storms (radar indicated). Hazards include 70 to 80 mph wind gusts. Flying debris will be dangerous to those caught without shelter. mobile homes will be heavily damaged. expect considerable damage to roofs, windows, and vehicles. extensive tree damage and power outages are likely. Locations impacted include, deltona, daytona beach, port orange, sanford and oviedo. 4/15/2018 3:43 PM EDT At 341 pm edt, severe thunderstorms were located along a line extending from near andalusia to deland airport, moving northeast at 45 mph (radar indicated). Hazards include 70 mph wind gusts. Expect considerable tree damage. damage is likely to mobile homes, roofs, and outbuildings. Locations impacted include, deleon springs, barberville, deland, daytona beach, ormond beach, holly hill and orange city. 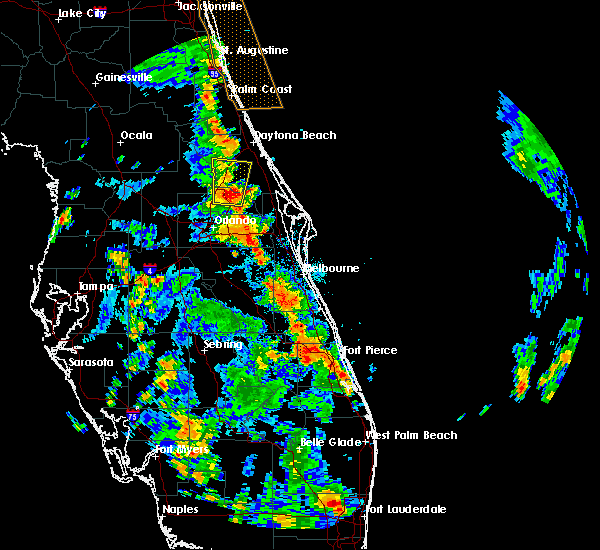 4/15/2018 3:41 PM EDT At 341 pm edt, severe thunderstorms were located along a line extending from near orange city to lake jessup, moving north at 65 mph (radar indicated). Hazards include 70 mph wind gusts. Expect considerable tree damage. Damage is likely to mobile homes, roofs, and outbuildings. 3/20/2018 5:32 PM EDT At 532 pm edt, a severe thunderstorm was located over deland airport, or near deleon springs, moving northeast at 55 mph (radar indicated). Hazards include 70 mph wind gusts and half dollar size hail. Hail damage to vehicles is expected. expect considerable tree damage. Wind damage is also likely to mobile homes, roofs, and outbuildings. 9/10/2017 10:35 PM EDT At 1034 pm edt, a severe thunderstorm capable of producing a tornado was located near klondike beach, or 8 miles northeast of haulover canal, moving northwest at 65 mph (radar indicated rotation). Hazards include tornado. Flying debris will be dangerous to those caught without shelter. mobile homes will be damaged or destroyed. damage to roofs, windows, and vehicles will occur. Tree damage is likely. 5/24/2017 4:12 PM EDT At 410 pm edt, severe thunderstorms were located along a line extending from near cassia to oviedo to near lake hart, moving northeast at 45 mph. other strong to severe storms were moving into saint cloud and southern orange county near orlando international airport (radar indicated). Hazards include 60 mph wind gusts. Expect damage to roofs, siding, and trees. Locations impacted include, orlando, deltona, saint cloud and sanford. 1/22/2017 7:39 PM EST At 738 pm est, a strong and dangerous tornado was located near geneva and lake harney, moving northeast at 60 mph. this is a particularly dangerous situation. take cover now! (radar indicated rotation). Hazards include damaging tornado. You are in a life-threatening situation. flying debris may be deadly to those caught without shelter. mobile homes will be destroyed. considerable damage to homes, businesses, and vehicles is likely and complete destruction is possible. the tornado will be near, maytown around 750 pm est. 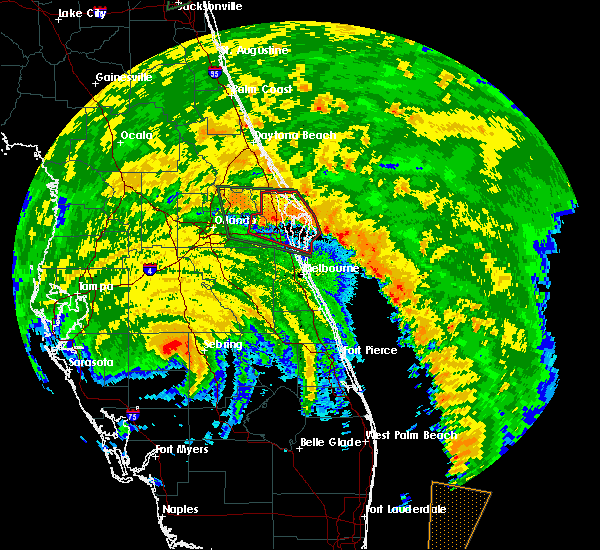 oak hill, apollo beach and bethune beach around 800 pm est. 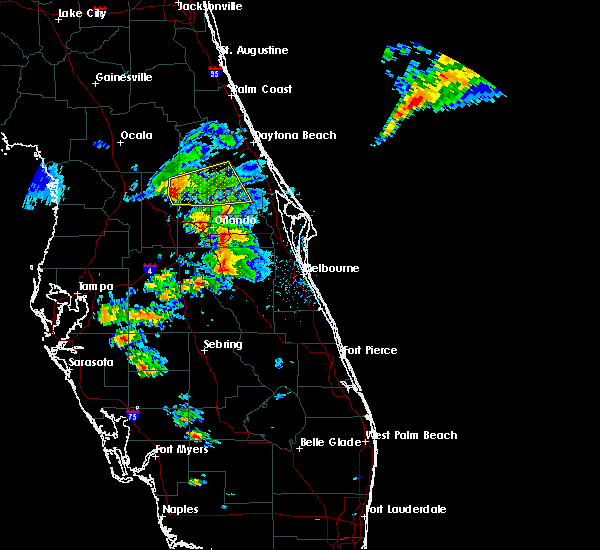 Other locations impacted by this tornadic thunderstorm include spruce creek. 1/22/2017 7:29 PM EST At 728 pm est, another severe thunderstorm capable of producing a tornado was located near deland, moving northeast at 60 mph (radar indicated rotation). Hazards include tornado and quarter size hail. Flying debris will be dangerous to those caught without shelter. mobile homes will be damaged or destroyed. damage to roofs, windows, and vehicles will occur. tree damage is likely. 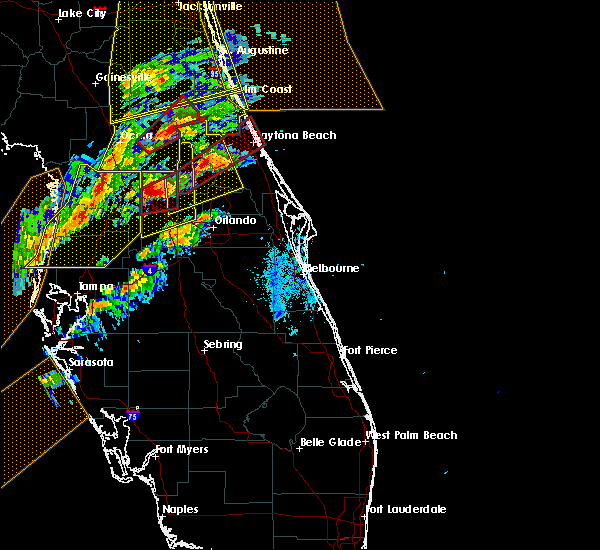 this dangerous storm will be near, deland and deland airport around 730 pm est. 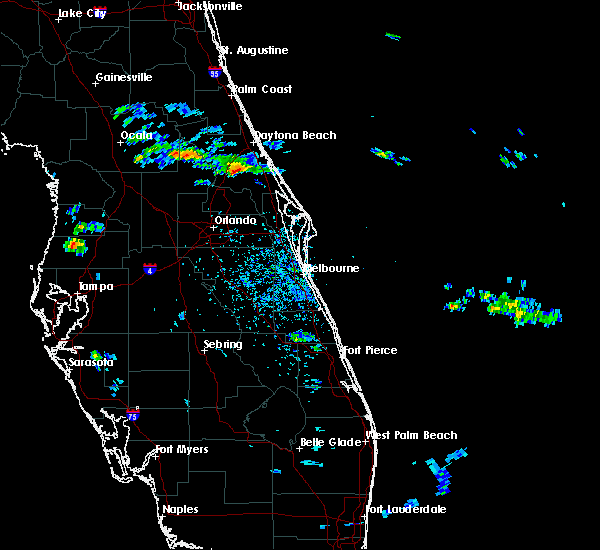 ormond beach, holly hill and daytona international speedway around 750 pm est. Other locations impacted by this tornadic thunderstorm include blue spring state park. 1/22/2017 7:19 PM EST At 718 pm est, severe thunderstorms capable of producing a tornado was located over winter park and near sanford, moving northeast at 55 mph (radar indicated rotation). Hazards include tornado and quarter size hail. Flying debris will be dangerous to those caught without shelter. mobile homes will be damaged or destroyed. damage to roofs, windows, and vehicles will occur. tree damage is likely. these dangerous storms will be near, goldenrod, azalea park and fern park around 720 pm est. oviedo, winter springs and lake jessup around 730 pm est. maytown around 750 pm est. 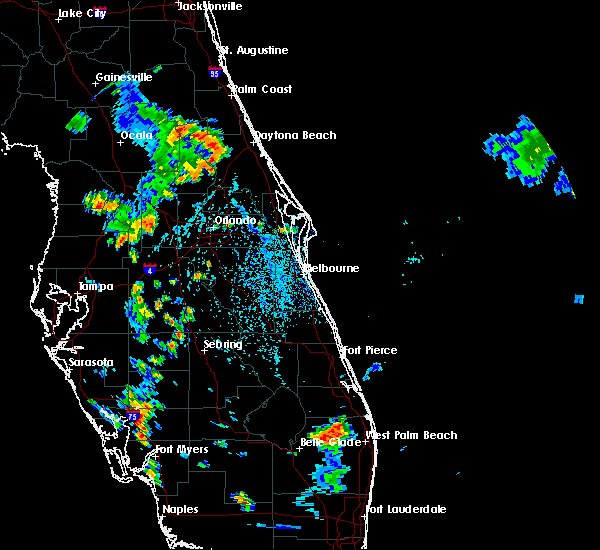 oak hill and apollo beach around 800 pm est. 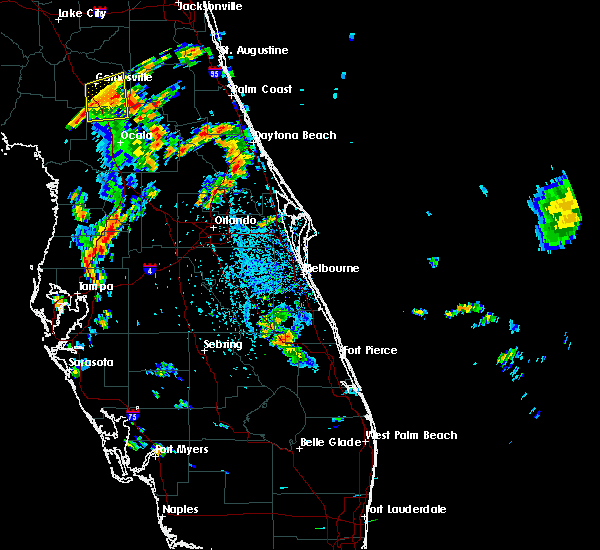 Other locations impacted by this tornadic thunderstorm include spruce creek. 1/22/2017 7:12 PM EST At 709 pm est, two strong and dangerous tornadoes were indicated by radar. 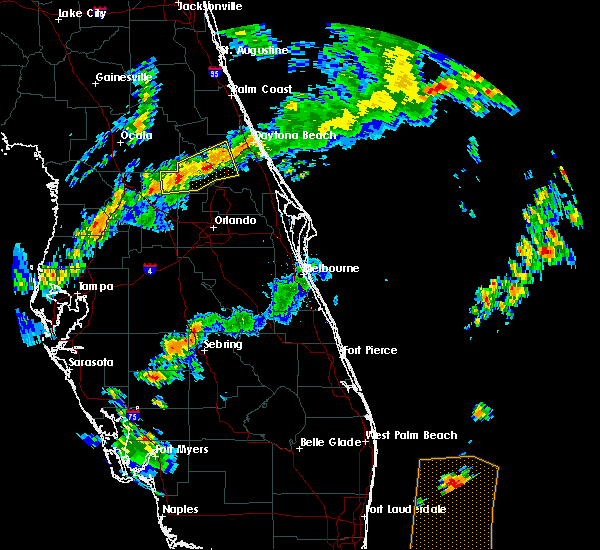 the first was located 7 miles northeast of deland airport, and rapidly approaching daytona beach. the second was near umatilla moving toward pine lake and lake mack. movement was northeast at 60 mph. this is a particularly dangerous situation. take cover now! (radar indicated rotation). Hazards include damaging tornadoes. You are in a life-threatening situation. flying debris may be deadly to those caught without shelter. mobile homes will be destroyed. considerable damage to homes, businesses, and vehicles is likely and complete destruction is possible. 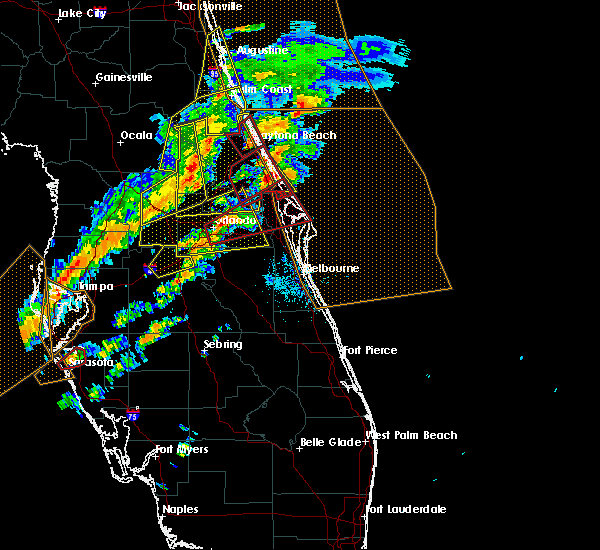 the tornadoes will be near, ormond beach, holly hill and daytona beach shores around 720 pm est. near pine lake and lack mack between 720 and 725 pm. Other locations impacted by this tornadic thunderstorm include lake woodruff. 1/22/2017 6:58 PM EST At 657 pm est, a strong tornado was indicated by radar over deland, moving northeast at 60 mph. this is a particularly dangerous situation. take cover now! (radar indicated rotation). Hazards include damaging tornado. You are in a life-threatening situation. flying debris may be deadly to those caught without shelter. mobile homes will be destroyed. considerable damage to homes, businesses, and vehicles is likely and complete destruction is possible. 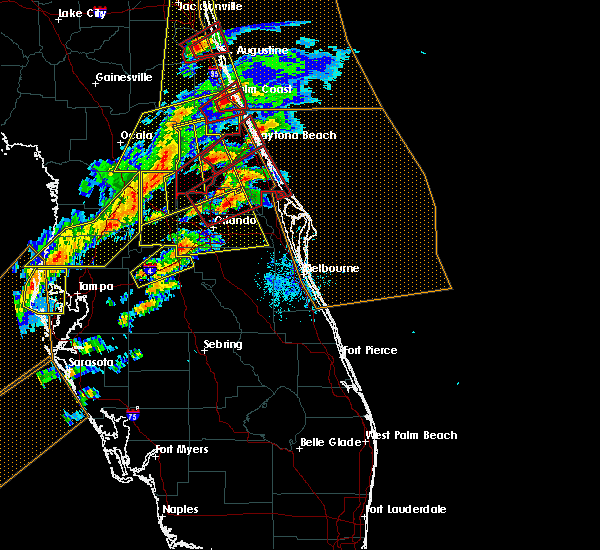 the tornado will be near, deland and deland airport around 700 pm est. daytona beach, daytona international speedway and daytona beach airport around 720 pm est. 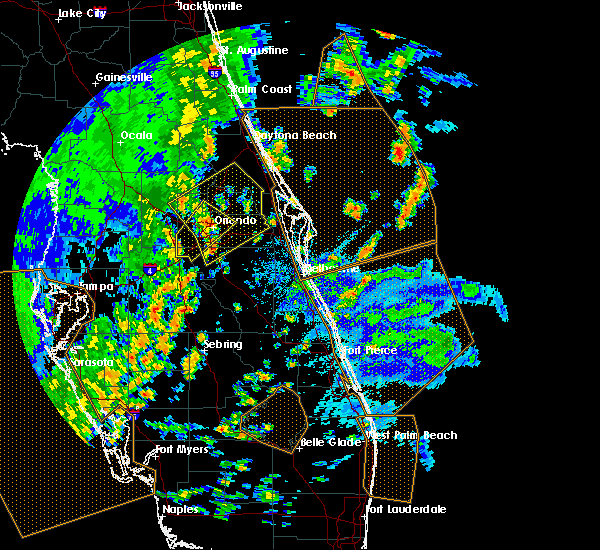 ormond beach, holly hill and daytona beach shores around 730 pm est. Other locations impacted by this tornadic thunderstorm include lake woodruff. 1/22/2017 6:44 PM EST At 644 pm est, a severe thunderstorm capable of producing a tornado was located near paisley, moving northeast at 60 mph (radar indicated rotation). Hazards include tornado and quarter size hail. Flying debris will be dangerous to those caught without shelter. mobile homes will be damaged or destroyed. damage to roofs, windows, and vehicles will occur. tree damage is likely. 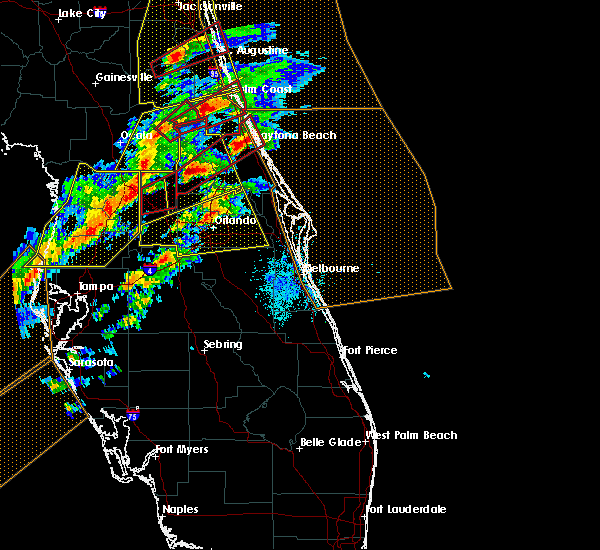 this dangerous storm will be near, deland airport around 700 pm est. 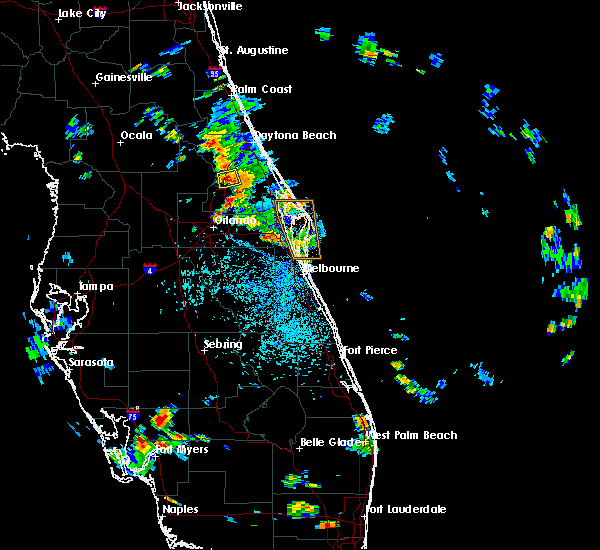 ormond beach, holly hill and daytona beach shores around 720 pm est. Other locations impacted by this tornadic thunderstorm include lake woodruff. 1/7/2017 6:29 AM EST At 628 am est, strong to severe thunderstorms were located near eustis, cassia, and deland, moving northeast at 45 to 50 mph (radar indicated). Hazards include 60 mph wind gusts and penny size hail. Expect damage to roofs, siding, and trees. Locations impacted include, deltona, deland, eustis, tavares and mount dora. 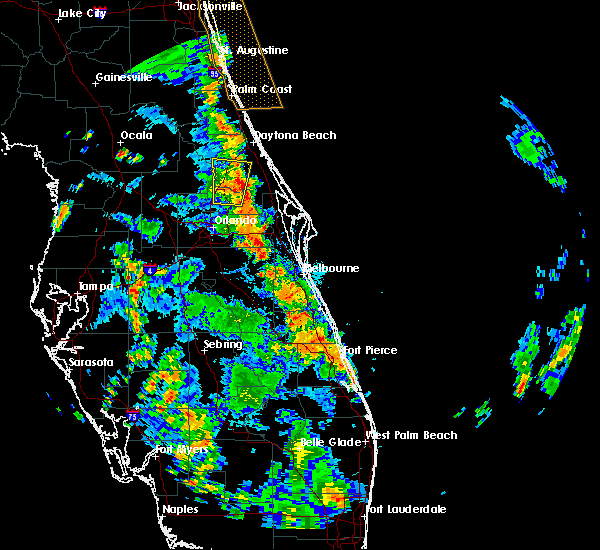 9/1/2016 3:36 PM EDT At 336 pm edt, severe thunderstorms were located along a line extending from near cassia to near lake mary, moving north at 35 mph (radar indicated). Hazards include 60 mph wind gusts. Expect damage to roofs. siding. And trees. 7/6/2016 8:49 PM EDT At 847 pm edt, a severe thunderstorm was located over deland, near the deland airport, moving east-southeast at 10 mph. another strong storm was approaching the western outskirts of daytona beach (radar indicated). Hazards include quarter size hail. Damage to vehicles is expected. Locations impacted include, daytona beach, deland, lake helen, deland airport and deland highlands. 7/6/2016 8:35 PM EDT At 835 pm edt, a severe thunderstorm was located over deleon springs, moving east-southeast at 10 mph (radar indicated). Hazards include quarter size hail. Damage to vehicles is expected. Locations impacted include, deland, lake helen, deleon springs and deland airport. 4/14/2016 3:48 PM EDT At 347 pm edt, a severe thunderstorm was located near deltona, moving east at 30 mph (radar indicated). Hazards include 60 mph wind gusts and quarter size hail. Hail damage to vehicles is expected. Expect wind damage to roofs, siding, and trees. 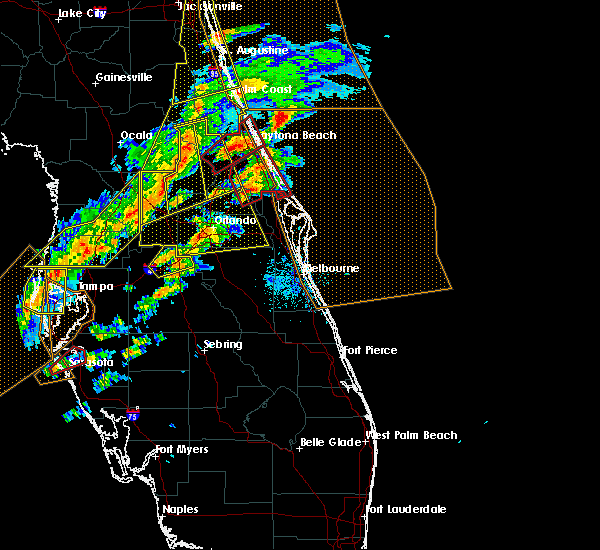 3/26/2016 7:57 PM EDT The severe thunderstorm warning for east central lake, northwestern seminole and south central volusia counties will expire at 800 pm edt, the storm which prompted the warning has weakened just below severe limits and will be allowed to expire. however, small hail, gusty winds and heavy rain are still possible with this thunderstorm. 3/26/2016 7:28 PM EDT At 727 pm edt, a severe thunderstorm was located near mount plymouth, moving east at 15 mph (radar indicated). Hazards include 60 mph wind gusts and quarter size hail. Hail damage to vehicles is expected. expect wind damage to roofs, siding, and trees. Locations impacted include, deltona, sanford, deland, eustis and mount dora. 3/26/2016 6:59 PM EDT At 658 pm edt, a severe thunderstorm was located near sorrento, or near mount plymouth, moving east-northeast at 25 mph (radar indicated). Hazards include 60 mph wind gusts and quarter size hail. Hail damage to vehicles is expected. Expect wind damage to roofs, siding, and trees. 1/22/2016 10:34 AM EST The national weather service in melbourne has issued a * severe thunderstorm warning for. northwestern orange county in east central florida. east central lake county in east central florida. northwestern seminole county in east central florida. 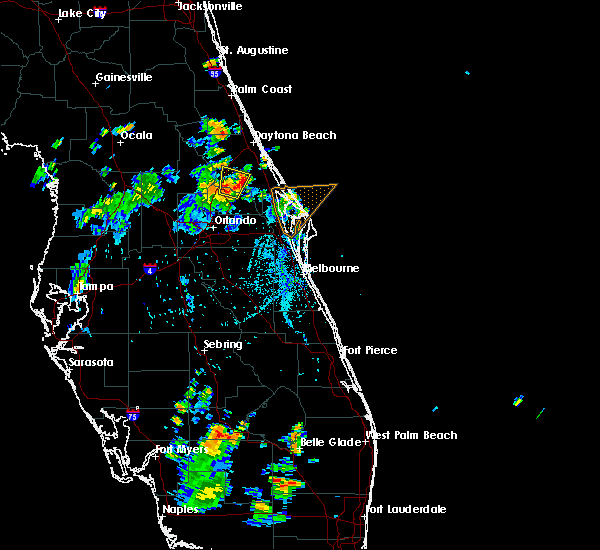 Central volusia county in east central florida. 7/6/2015 4:18 PM EDT At 417 pm edt, doppler radar indicated a severe thunderstorm capable of producing quarter size hail and damaging winds in excess of 60 mph. this storm was located over barberville, and moving east to northeast at 10 mph. 7/5/2015 4:12 PM EDT At 411 pm edt, doppler radar indicated a severe thunderstorm capable of producing quarter size hail and damaging winds in excess of 60 mph. this storm was located near lake helen, and moving south at 10 mph. 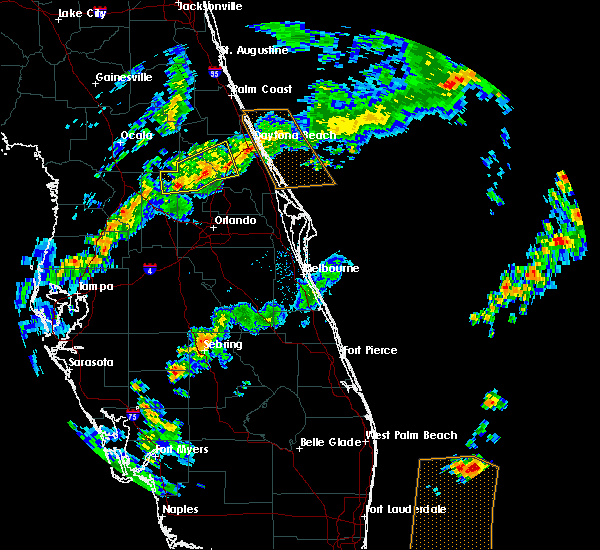 7/4/2015 5:21 PM EDT At 520 pm edt, doppler radar indicated a severe thunderstorm capable of producing damaging winds in excess of 60 mph. this storm was located 7 miles southwest of deleon springs. this storm was nearly stationary and was increasing in both size and intensity. 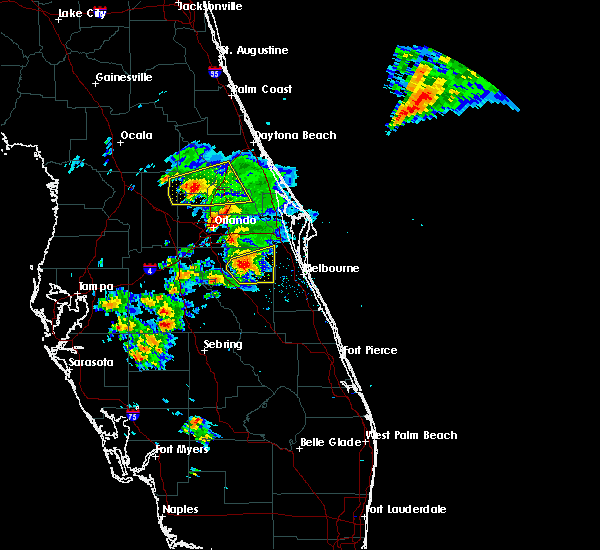 6/24/2015 7:35 PM EDT A severe thunderstorm warning remains in effect until 815 pm edt for south central volusia and northwestern seminole counties. at 732 pm edt. doppler radar indicated a severe thunderstorm capable of producing damaging winds in excess of 60 mph. this storm was located over lake helen. moving northeast at 35 mph. Locations impacted include. 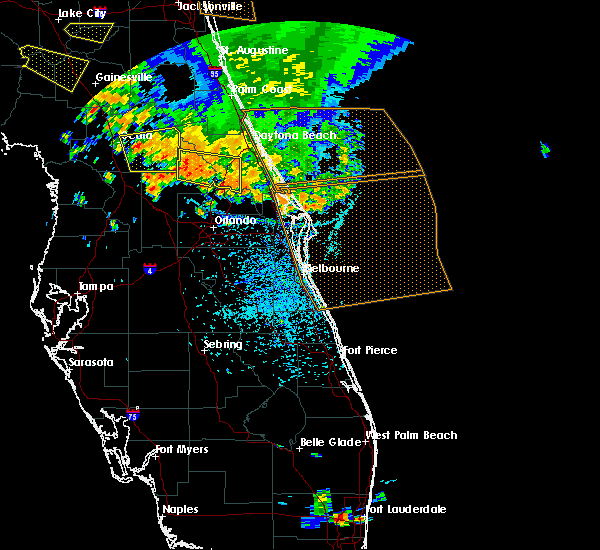 6/24/2015 7:13 PM EDT At 713 pm edt, doppler radar indicated a severe thunderstorm capable of producing damaging winds in excess of 60 mph. this storm was located near sanford, and moving northeast at 35 mph. 6/1/2015 3:28 PM EDT At 327 pm edt, doppler radar indicated a severe thunderstorm capable of producing quarter size hail and damaging winds in excess of 60 mph. this storm was located over debary, and moving south at 5 to 10 mph. 6/1/2015 2:49 PM EDT At 249 pm edt, doppler radar indicated a severe thunderstorm capable of producing quarter size hail and damaging winds in excess of 60 mph. this storm was located over deland, and moving southeast at 5 to 10 mph. 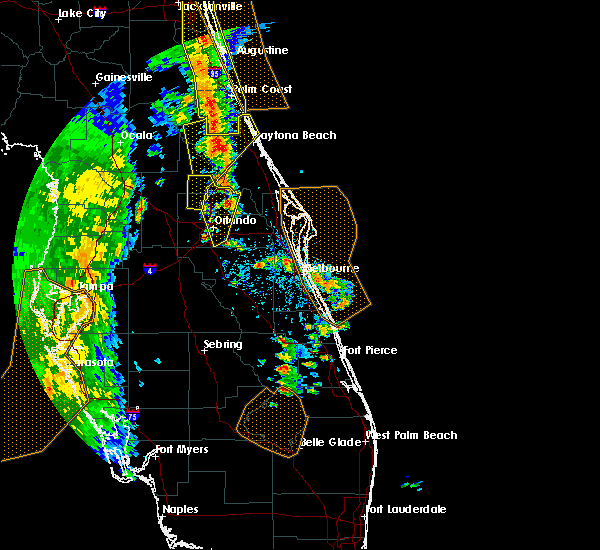 * this severe thunderstorm will be near, orange city around 250 pm edt. lake helen around 300 pm edt. 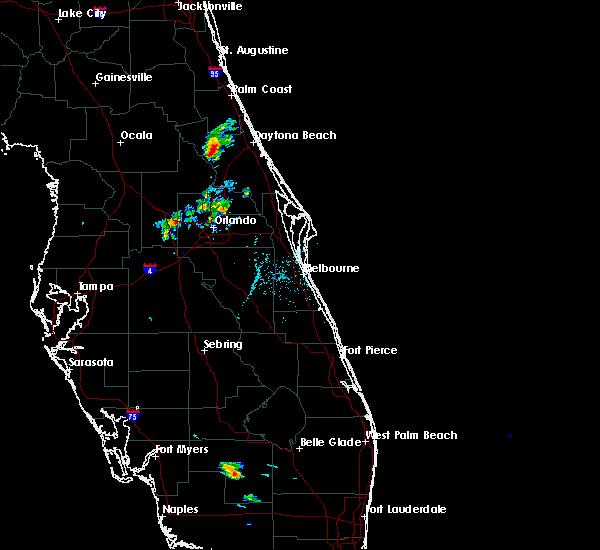 deltona around 310 pm edt. other locations impacted by this severe thunderstorm include blue spring state park. 5/20/2015 5:56 PM EDT At 554 pm edt, doppler radar indicated a severe thunderstorm capable of producing quarter size hail and damaging winds in excess of 60 mph. this storm was located near osteen, or near deltona, moving east to southeast at 15 mph. locations impacted include, deltona, osteen and farmton. 5/20/2015 5:43 PM EDT At 542 pm edt, doppler radar indicated a severe thunderstorm capable of producing quarter size hail and damaging winds in excess of 60 mph. this storm was located near deltona, and moving east at 15 mph.